Last week I blogged about why houses need HRVs. This week I’ll write about maintenance and operation of HRVs; I’ll try to cover the stuff you should know if you own one. The information in this post is generic – every manufacturer will have their own set of instructions and their own maintenance schedule, but I’ve found that they’re all nearly identical. 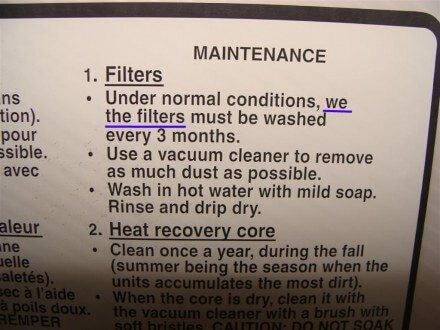 Every three to six months the filters should be cleaned by vacuuming to remove as much dust and debris as possible, then washed with warm water and mild soap. Some filters can also be washed in the top tray of a dishwasher, but this may tarnish the aluminum finish. The filter below should have been cleaned a long, long time ago, and this is what I find at almost every home inspection – way more than dirty furnace filters. While I’m on the topic of filter cleaning for HRVs, I just had to share this photo I took during a new construction inspection in Blaine a couple years ago. 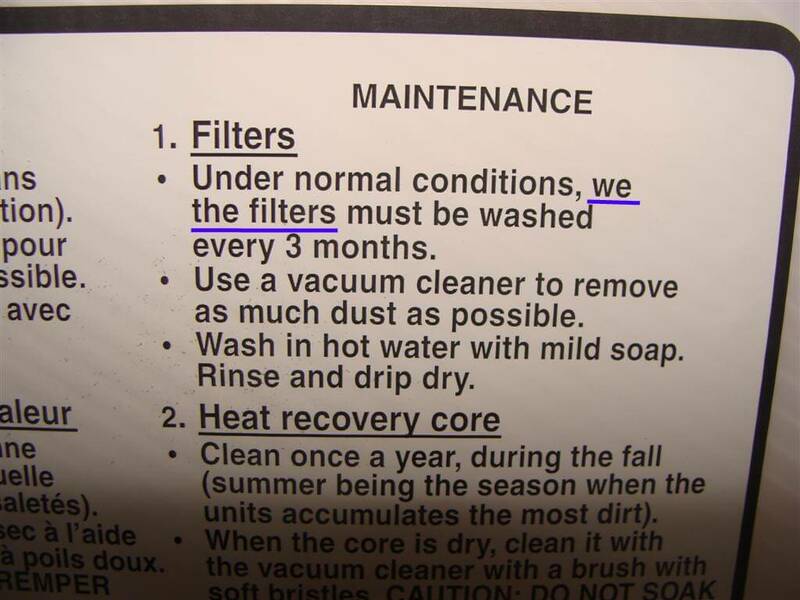 Someone was having a little fun at their job when they wrote the maintenance instructions for this HRV. I added the blue underline. Every three to six months Clean the condensation tray with damp cloth. The condensation tray is the area where water will collect in the bottom. 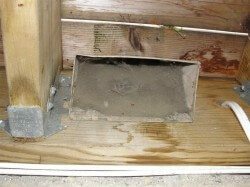 The condensate drain should be checked, and replaced if needed. 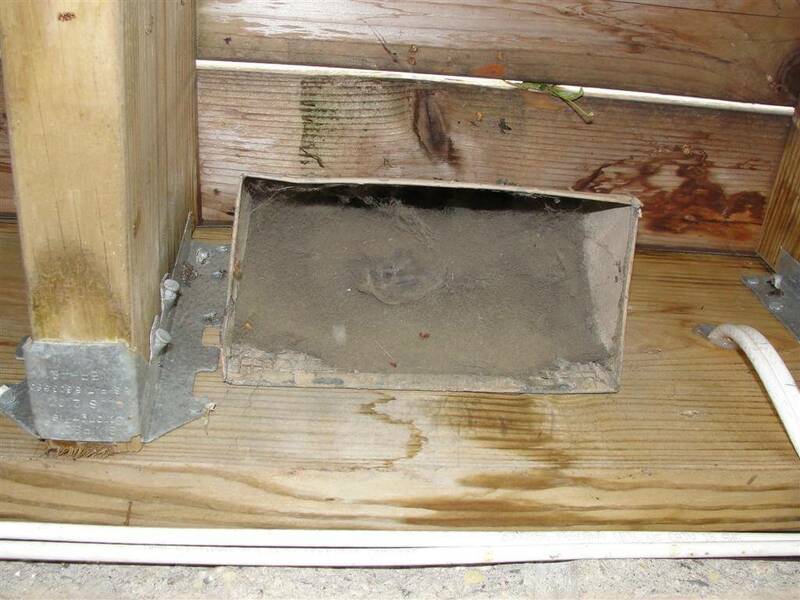 The drain tube usually consists of clear plastic tubing with a little loop that creates a trap to prevent odors from the floor drain or wherever else from getting sucked in to the HRV. Every three to six months Check the intake grill at the exterior of the home to make sure it’s clean. These get very dirty, as there is a fan constantly pulling air in. Every six to twelve months the core should be cleaned by removing it and letting it soak in a mixture of lukewarm water and mild soap. Rinse the core thoroughly when done. If you own a summer core, don’t get it wet, as you’ll cause permanent damage to it. Summer cores can be cleaned by vacuuming with a brush attachment. Every one to three years the fans should be cleaned. This typically requires removal of the fan assembly. Check the owner’s manual for specific instructions, or hire a professional to do this. If the HRV has a switch located on the unit itself, it will typically have a couple of the following settings, but not all: On, High, Low, Off, or Remote. If your HRV has a “Remote” setting, you’ll probably want to use that one. This will allow the HRV remote controller, usually mounted on the wall next to the thermostat, to turn the HRV on and off. This remote will also typically have a dehumidistat, which controls how much moisture is in the air. If the bathrooms in the house have funny little wall buttons instead of bathroom exhaust fan switches, it typically means that the HRV system has had ductwork installed in the bathrooms. This is an acceptable alternative to bathroom exhaust fans. When the wall button is pushed, this will turn on the HRV for somewhere between 15 – 60 minutes, or will kick the HRV in to high gear for 15 – 60 minutes. Every HRV should also have a defrost cycle, and the HRV should go in to the defrost cycle automatically when it gets too cold. The defrost cycle is actually quite simple; the exhaust fan just runs for about five minutes with the outdoor air inlet blocked off, which forces a bunch of warm indoor air through the core without bringing in any cold air. If you plan to operate your HRV during the summer, check your owner’s manual to see what the manufacturer has to say about it. If your HRV is designed to run during the summer, you may need to remove the standard winter core and install a summer core. The difference is that the summer core is designed to remove moisture from the air coming IN to the house, rather than the air leaving. If there is no mention in your owners manual about running your HRV during the summer, you probably shouldn’t. That’s about all for maintenance – for any more specific instructions, you’ll need to check your owner’s manual. Next week I’ll talk about installation defects.